Two-time Winston-Salem Open champion and current world No. 10 John Isner as well as fan favorite and Top 20 player Tommy Robredo have committed to play the 2014 Winston-Salem Open, which will be held from Aug. 16-23 at the Wake Forest Tennis Complex. Isner, a Triad, N.C., native, and Robredo are the first players to join what is expected to be another strong field at Winston-Salem’s ATP World Tour 250 event. Tickets to the 2014 Winston-Salem Open will go on sale to the public on June 9, and fans who purchase their tickets prior to July 1 will receive a 10 percent discount. Complete ticket information, including pricing and packages, is available on WinstonSalemOpen.com. 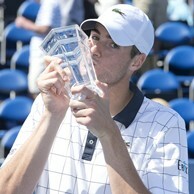 The champion of the 2011 and 2012 Winston-Salem Opens, Isner is having one of the best years of his career. He has been ranked as high as No. 9 in the world this spring after a number of impressive performances, including a semifinal appearance at the ATP Masters 1000 event at Indian Wells in March. Isner won the eighth ATP singles title of his career in Auckland, New Zealand, back in January and reached the semifinals in Delray Beach, Fla., in February. A graduate of Greensboro’s Page High School and four-time All-American at the University of Georgia, Isner has never lost a match at the Wake Forest Tennis Complex. He will be returning to Winston-Salem after an injury prevented him from defending his titles last year. Robredo, who will be competing in the Winston-Salem Open for the third year in a row, has had a career renaissance at age 31, rising to his current ranking of No. 18 in the world after recovering from a knee injury that dropped him out of the Top 400 less than two years ago. A seven-time Grand Slam quarterfinalist, he has been ranked as high as No. 5 in the ATP rankings in his career. The Spaniard reached the quarterfinals at Roland Garros and the US Open last year and advanced to the fourth round of the Australian Open in January before falling to eventual champion Stanislas Wawrinka. He has also made the semifinals in Buenos Aires and the quarterfinals in Rio de Janeiro in 2014.